My mom passed away last week after a long battle with dementia. As I sat by her bed and held her hand, I was filled with an overwhelming sadness. Sad, not just because she was dying but for the life she could have lived. See, my mom adored my father. They were soulmates. When he died in 2004, a good chunk of her died too. She spent 14 years praying to join him. I always thought of how sad my dad would have been if he knew that the woman he left behind squandered the life she still had ahead of her. Left financially secure, she could have travelled or spent time with her children, taking pleasure in the lives they were carving for themselves. She could have had fun. Instead, she let fear and anxiety hold her back. But then, that was the story of my mom’s life. She was too frightened to take risks. She lacked the belief in herself to try new things. Most of all, I think, she was afraid to take care of her happiness. Instead, she relied on my dad, and later on others, to make her happy. 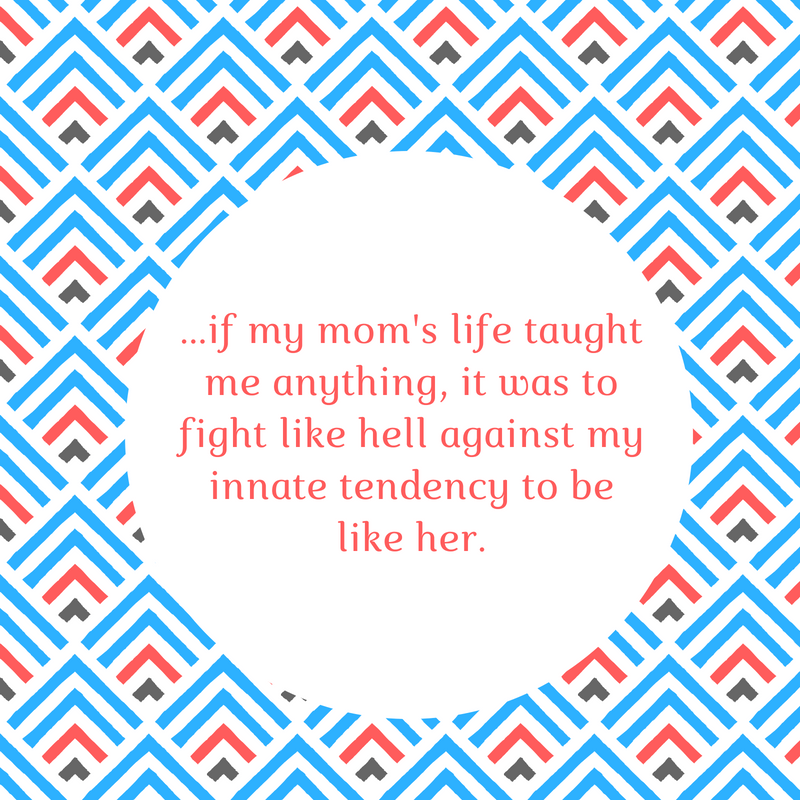 I thought of this as I watched her die, and I realized that if my mom’s life taught me anything, it was to fight like hell against my innate tendency to be like her. I too, let fear hold me back. I too, have often sacrificed what I truly wanted for the practical or the path of least resistance. If I am to enjoy my last few decades on this earth, however, I need to take control of my happiness. I need to be willing to take risks and try new things. I need to be better at exercising true self-care by making my goals and dreams a reality, and I need to help the Captain do the same. So, thanks for the lesson, Mom. I know if wasn’t the one you intended to teach me, but I like to think it’s the one that will have the biggest impact. It is true though that sometimes the things we don’t say or do speak the loudest.